Although window-boxes can be had ready-made, a made-to-measure job of teak, cedar or oak will look better than an ill-fitting affair made of artificial materials. Hardwoods look better unpainted and may be either oiled or varnished. Softwoods should be treated with preservative and may be painted. The timber should be at least 1cm (1/2 in) thick and the inside depth should be from 18-25cm (7-10in). If the window sill exceeds 1.6m (5ft) you may make two boxes, each half the required length to make fixing and handling easier. If the front of the box slopes at a slight angle outwards it will be easier to grow trailing plants in the box. It is best to use screws of galvanized iron or brass to hold the various sections of the box together. Drainage holes are essential and should be about 1 cm (1/2 in) in diameter. Make a double row of holes with about 16cm (6in) between the holes in each row. Fixing A window-box on a high sill that is not securely fixed can be dangerous, so use long hasps and staple fittings to secure the box to the window frame. The eye can be screwed to the side of the box and the hook to the window frame. This makes it easy to remove the box. Where the window ledge has a downward and outward slope use a batten of wood to level up the box. Ready-made boxes Wood, galvanized iron, aluminium, plastic and fibreglass are all materials used, and many types have galvanized containers which can be planted and then just dropped into position. This makes it easy to switch containers with plants newly-flowering to take the place of containers in which the plants have finished flowering. This advantage can also be obtained by using the boxes for pot plants, which can be placed on shallow trays within the box. Preparation The soil should have a good texture and be rich in humus and plant nutrients. It is better to prepare the box actually sited on the window ledge, as this saves carrying a box full of soil to the ledge and siting it in what is often an awkward position. Lay broken crocks on the bottom of the box at about 1cm (1/2 in) deep to prevent soil being washed out of the drainage holes and at the same time give adequate drainage. On top of this a fibrous material such as peat should be laid at a depth of 5cm (2in). To within 1cm (bin) of the rim the soil proper should be John Innes No 2, or you can mix up 3 parts loam (or good garden soil), 1 part of peat or leafmould and 1 part of sharp sand. To each add 4d1 (bushel) add two or three handfuls of bonemeal. The soil should be changed every two or three years, or the top 5-7cm (2-3in) should be replaced with fresh soil or compost. together with foliage plants, such as coleus, or the grey-leaved Senecio cineraria, will provide a summer display requiring little maintenance. 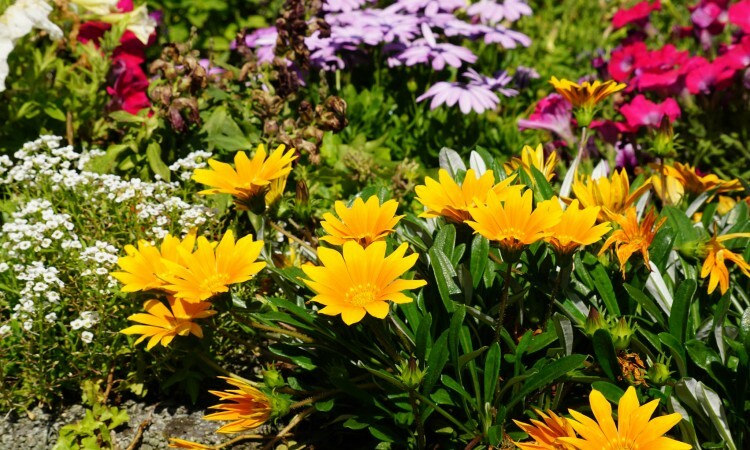 Hardy and half-hardy plants, including stocks, zinnias and verbenas, all give a long-lasting display if the dead flowers are picked off regularly. Tobacco plants, French and African marigolds also make a good effect. cinerarias, schizanthus and primulas are excellent, but the first three need a sheltered south-facing aspect. Pot chrysanthemums are tougher, provided they have been hardened off. These can be used in the box from April to November or December. Trailing plants and climbers Creeping Jenny, canary creeper, ivy-leaved geraniums and nasturtiums are decorative, and on south-facing aspects the trailing Campanula fragilis can be induced to give a fine display in late summer. Climbing plants should be planted at the ends of the box and allowed to climb up the walls on either side of the window with suitable supports. Cobaea scandens is an outstanding half-hardy climber which will scale 10m (30ft) in one season. The golden leaved hop. Humulus japonicus aureus, is another interesting and attractive climber. Climbing nasturtiums will cling to strings or wires, and good varieties include the scarlet ‘Lucifer’ and the rich red ‘Indian Chief’. Ipomoea rubrocaerulea ‘Heavenly Blue’ (morning glory) is another half-hardy climber that likes a sheltered, sunny position. The convolvulus-type flowers open in the morning and are finished by noon and have intensely blue trumpets. aureo-variegata or the smaller-leaved `Buttercup’. Vines, also the Virginian creeper, Parthenocissus quinquefolia, or the smaller-leaved, more compact P. henryana, Vitis vinifera purpurea and V. coignetiae are all suitable. Bulbs One of the best times of year for a window-box is early in the year when daffodils, tulips, hyacinths, scillas, chionodoxas and other bulbs are flowering. Plant closely as soon as the summer display has ended, or plant bulbs at the point of flowering after Christmas. Make sure that the latter are hardened off and do not put them outside until early March. Freesias are also pretty bulb plantings for window box gardens.